IS THIS YET ANOTHER PAID TIPS SITE ? Dear Readers, this is a purely non-profit initiative and will never become a paid site. Primary objective is to share as much information as possible from real life trading experience to help small traders earn consistently in the market. ICICI Bank – Buy above 1112 for a target of 1125 with SL at 1095. Target achieved. Above 1112, the stock touched 1127. Axis Bank – Buy above 1395 for a target of 1405-15 with SL at 1280. Both targets achieved. Above 1395, the stock shot up to 1436. SBIN – Buy above 2270 for a target of 2280-2300 with SL at 2248. Both targets achieved. Above 2270 , the stock touched 2312. Bajaj Auto – Buy above 1805 for a target of 1812-28 with SL at 1784. First target achieved. Days high at 1817. Reliance – Sell on rise to 782-785 levels with SL at 792 for a target of 776-72. Days high was 785 and close at 781. No profit/loss. L&T – Sell below 1425 for a target of 1415 with SL at 1445. Below 1408-10 levels , fresh sell for a target of 1385-90 levels. Call did not trigger. ONGC – Sell below 325 for a target of 323-319 with SL at 331. Call did not trigger. Days low was 325.10 !! Ranbaxy – Sell below 442 for a target of 438-34 with SL at 446. Call did not trigger. Infosys – Sell below 2270 for a target of 2250 with SL at 2285. Below 2250, the stock will touch 2220.Call did not trigger. Nifty will face resistance at 5700 followed by 5725-35 and 5760. Support will be at 5665-5635-5600. Avoid intraday longs below 5700. Nifty will be positive above 5700 and bullish above 5735. ICICI Bank – Buy above 1112 for a target of 1125 with SL at 1095. Axis Bank – Buy above 1395 for a target of 1405-15 with SL at 1280. SBIN – Buy above 2270 for a target of 2280-2300 with SL at 2248. Bajaj Auto – Buy above 1805 for a target of 1812-28 with SL at 1784. 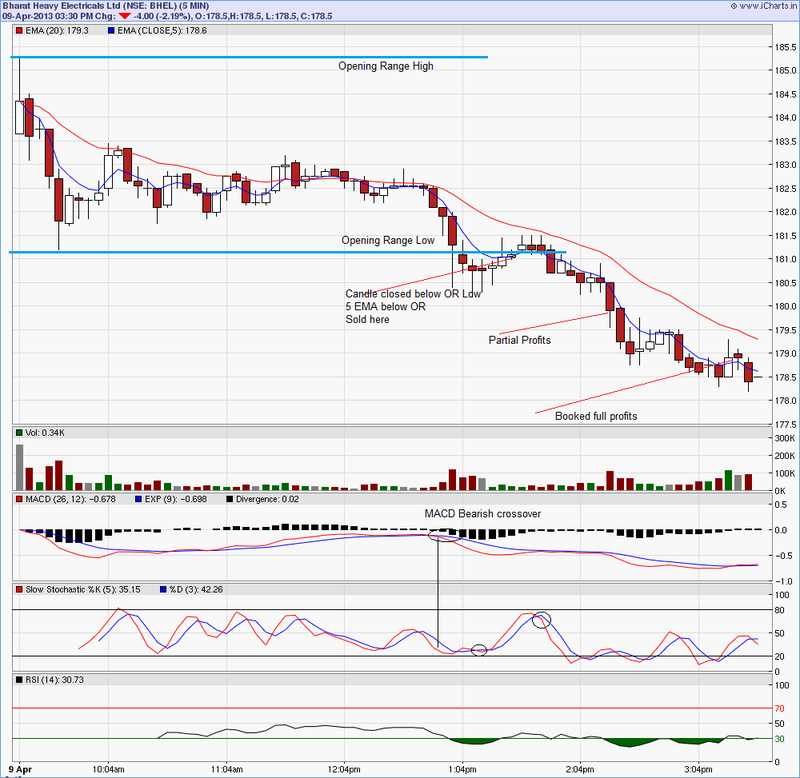 Reliance – Sell on rise to 782-785 levels with SL at 792 for a target of 776-72. L&T – Sell below 1425 for a target of 1415 with SL at 1445. Below 1408-10 levels , fresh sell for a target of 1385-90 levels. ONGC – Sell below 325 for a target of 323-319 with SL at 331. TCS – Sell below 1460 for a target of 1445, SL for short is 1495. Sustaining below 1430-25 range will take the stock to 1390-50 levels in next few days. Ranbaxy – Sell below 442 for a target of 438-34 with SL at 446. Infosys – Sell below 2270 for a target of 2250 with SL at 2285. Below 2250, the stock will touch 2220. We had all calls in profit today. Reliance – Sell below 800 for a target of 790. If sustained below790, there is a chance of stock hitting 775 either today or in next 2 trading days. 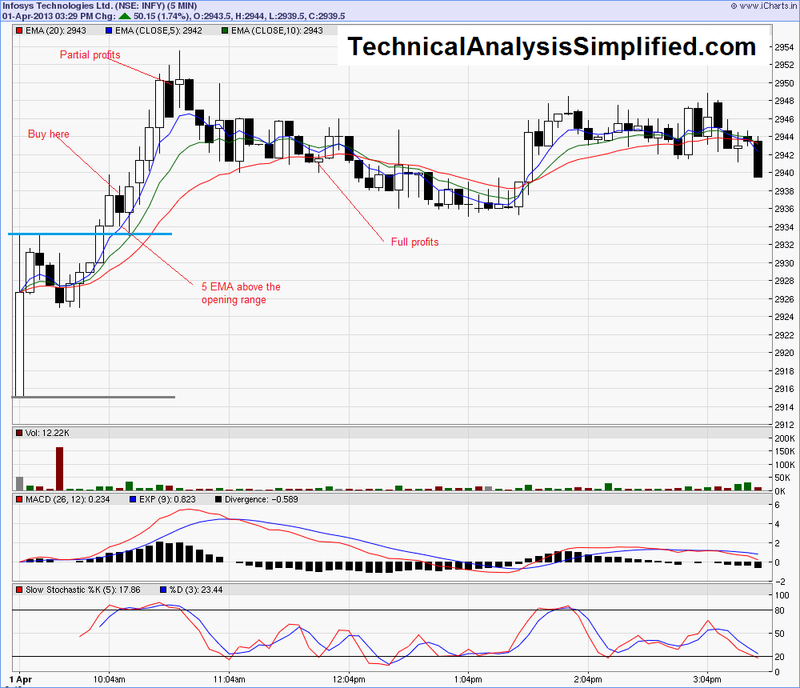 SL for shorts is 814.Achieved all targets. Days low was 769. BHEL – Buy above183.50 for a target of 184.50-186.50 with SL at 181. First target achieved. BHEL above 183.5 hit the first target 184.5. L&T – Buy above 1430 for a target of 1445 with SL at 1420. Target touched at opening. No trade was possible.Referring today’s intraday chart of L&T, 20 EMA was sloping continuously down, so no intermediate buying opportunity. ICICI Bank – Buy above 1085 for a target of 1095 with SL at 1070. Target Achieved. days high was 1111. SBI – Buy above 2195 for a target of 2205-2225 with SL at 2170. Target achieved. Days low was exactly at 2195 and high at 2269. Infosys – Sell below 2290 for a target of 2280 with SL at 2305.Target achieved. Below 2290, stock touched 2250. Bajaj Auto – Buy on decline to 1770-65 with SL at 1750 for a target of 1780. Sustaining above 1780, fresh buy with SL at 1765 for a target of 1795. Target achieved. Stock sustained above 1780 and touched 1805. 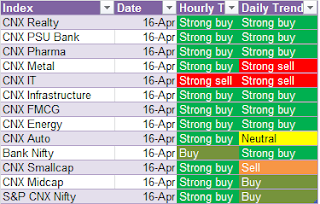 Nifty had a fantastic run up on 16th April though the global cues were negative.Most of the sectors have turned buy in both hourly and daily charts. Auto stocks rallied heavily on rate cut hopes and reduction in petrol prices. Banking sector also rallied.Only IT sector closed in red today. In the short term, on crossing 5700, market will face resistance at 5755 and 5775. Closing above 5775 will trigger hopes in further up move towards 5900. For 17 April, Nifty will face resistance at 5740 followed by 5755-5775. Support will be 5650. Avoid intraday longs below 5650. Nifty will be positive above 5700 and bullish above 5740. Reliance – Sell below 800 for a target of 790. If sustained below790, there is a chance of stock hitting 775 either today or in next 2 trading days. SL for shorts is 814. BHEL – Buy above183.50 for a target of 184.50-186.50 with SL at 181. L&T – Buy above 1430 for a target of 1445 with SL at 1420. SBI – Buy above 2195 for a target of 2205-2225 with SL at 2170. Axis Bank – Buy above 1370 for a target of 1380-90 with SL at 1358. Infosys – Sell below 2290 for a target of 2280 with SL at 2305. Ranbaxy – Buy above 450 for a target of 454 – 458 with SL at 445. Bajaj Auto – Buy on decline to 1770-65 with SL at 1750 for a target of 1780. Sustaining above 1780, fresh buy with SL at 1765 for a target of 1795. In this course, I am introducing a intraday trading system which is primarily based on MACD indicator used in conjunction with EMAs and Stochastics. This system is intended for scalping, which means – taking small and quick profits. There are certain strict rules to be followed to enter a trade. 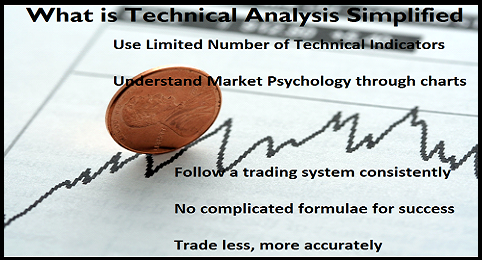 Following the system religiously can significantly improve the success ratio of intraday trades. 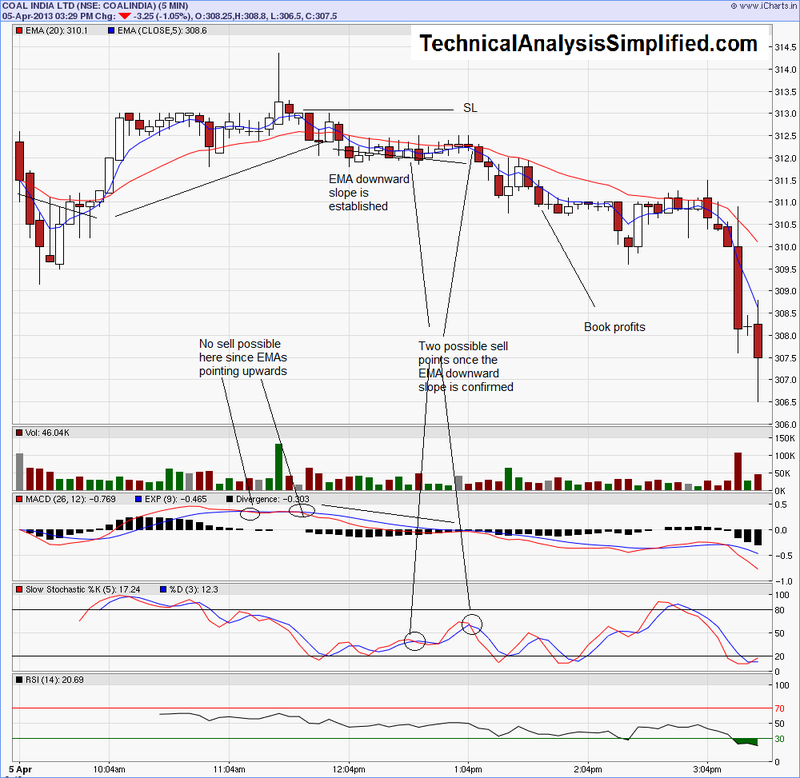 Trading system trigger is an MACD bullish or bearish crossover. 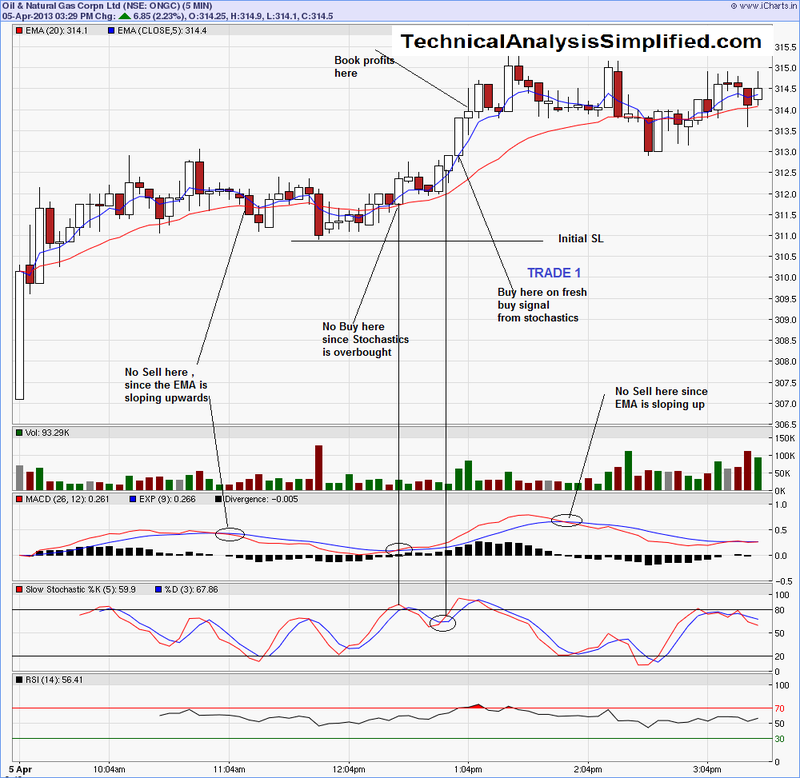 Stochastics and Moving averages are used in combination with the MACD signal to enter the trade. Buy when MACD gives a bullish crossover. 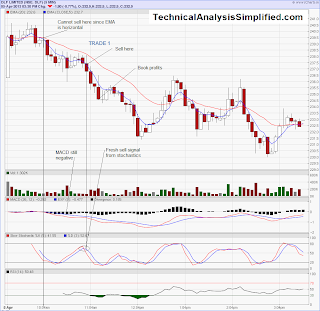 Sell when MACD gives a bearish crossover. PLEASE NOTE THAT THE ABOVE SYSTEM IS GENERIC, THE RULES BELOW WILL MAKE IT A SPECIFIC SYSTEM. IF YOU ARE FOLLOWING THIS SYSTEM, PLEASE FOLLOW ALL THE RULES FOR BUY / SELL STRICTLY. 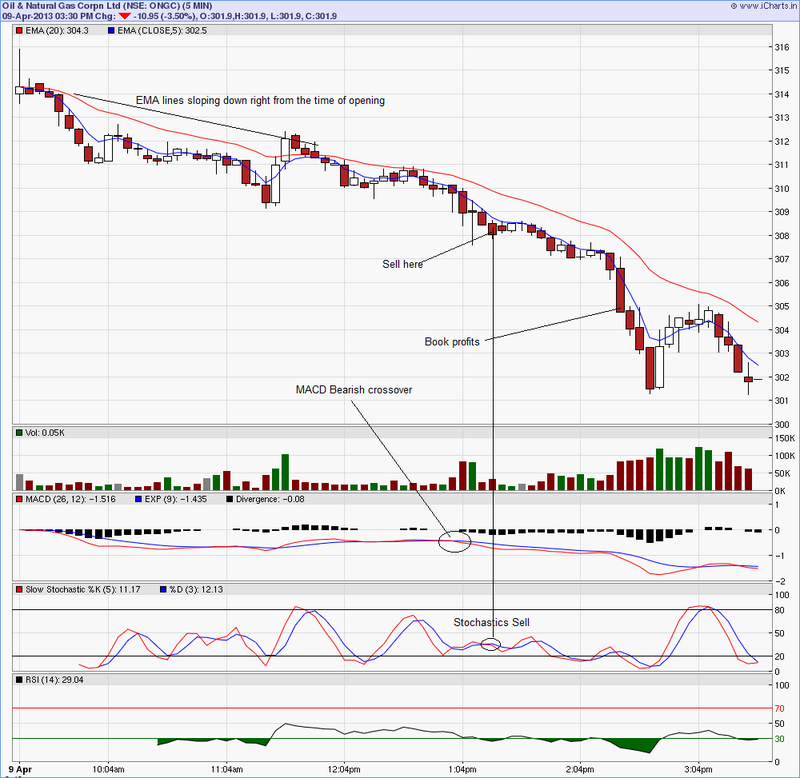 5 min and 20 min EMA, MACD and Slow Stochastics are the indicators used. Stock should be showing a trend. This will be evident from the slope of the EMAs. If EMAs are horizontal, then no trade is possible. 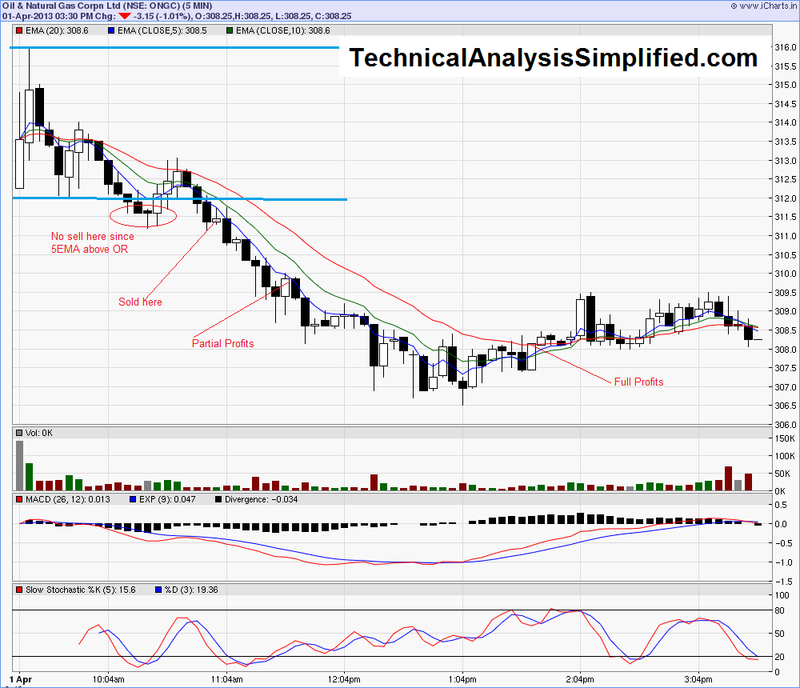 Dual Time Frame Confirmation: 15/30 min chart is in the direction of the trade. Do not buy near resistance or sell near support. 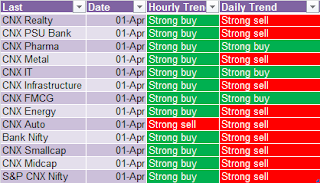 Resistances and Support levels are - pivot points, days high/ low, previous swing highs, lows etc. This is a scalping system, so profits should be booked very quickly unless there is a highly bullish or bearish trend . To give an indication of scalping points assuming the trades are done in F&O in NSE. Lot size 1000 – take profits when the stock moves by 1 point. Lot size 250 – take profits when the stock moves by 3-4 points. Lot size 125 – take profits when the stock moves by 4-5 points. 20 min EMA is sloping upwards. 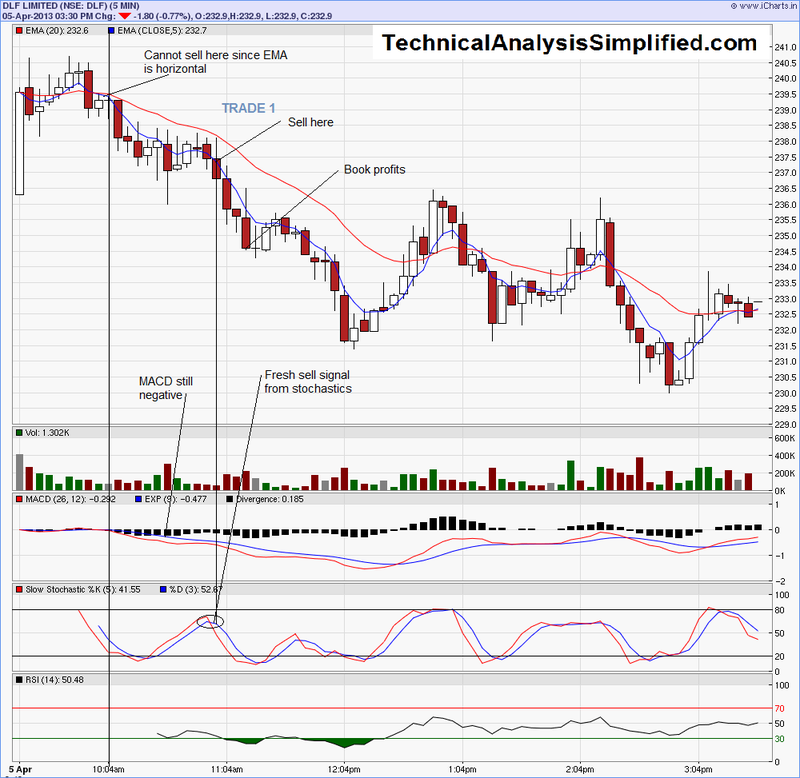 MACD gives a bullish cross over. 5 EMA should be above 20 EMA line. 5 min candle should close above the 20 EMA line. Stochastics should not be in overbought condition. 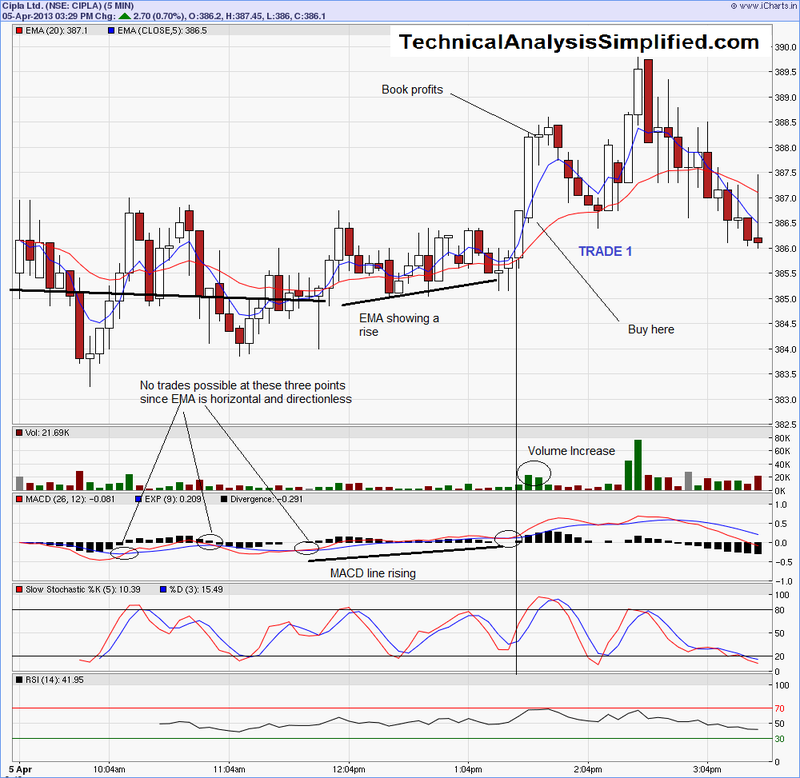 If Stochastics is in buy mode already, enter the trade. 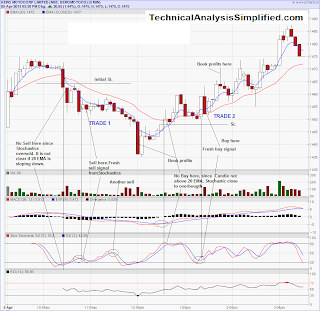 If Stochastics is not in buy mode, wait for the stochastics to give a buy signal and enter the trade. 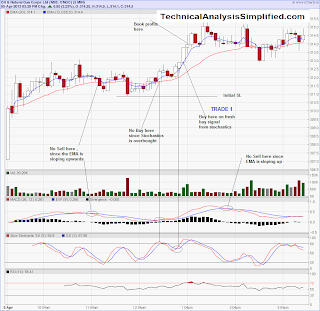 If Stochastics is overbought, a fresh buy signal can be used to enter if the MACD is still positive. Previous Swing low is the stop loss. Previous swing low is the low made in the just previous up move. Please see examples to understand stoploss points. As indicated before, this is a scalping system. Book profits immediately on seeing profits and exit immediately when the stoploss is hit. 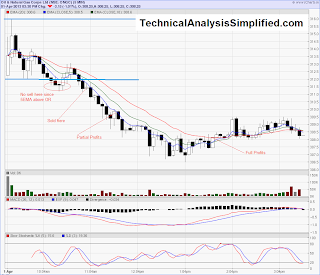 Stochastics is overbought; %K crosses below %D and moves below the overbought line and 5 min candle closes below 20 EMA. 20 min EMA is sloping downwards. 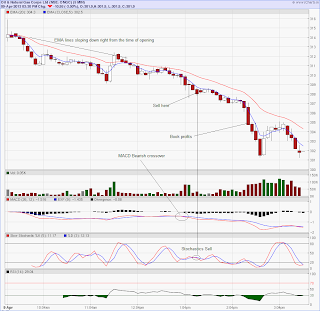 MACD gives a bearish cross over. 5 EMA should be below 20 EMA line. 5 min candle should close below the 20 EMA line. Stochastics should not be in oversold condition. 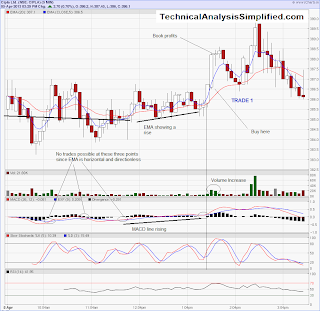 If Stochastics is in sell mode already, enter the trade. 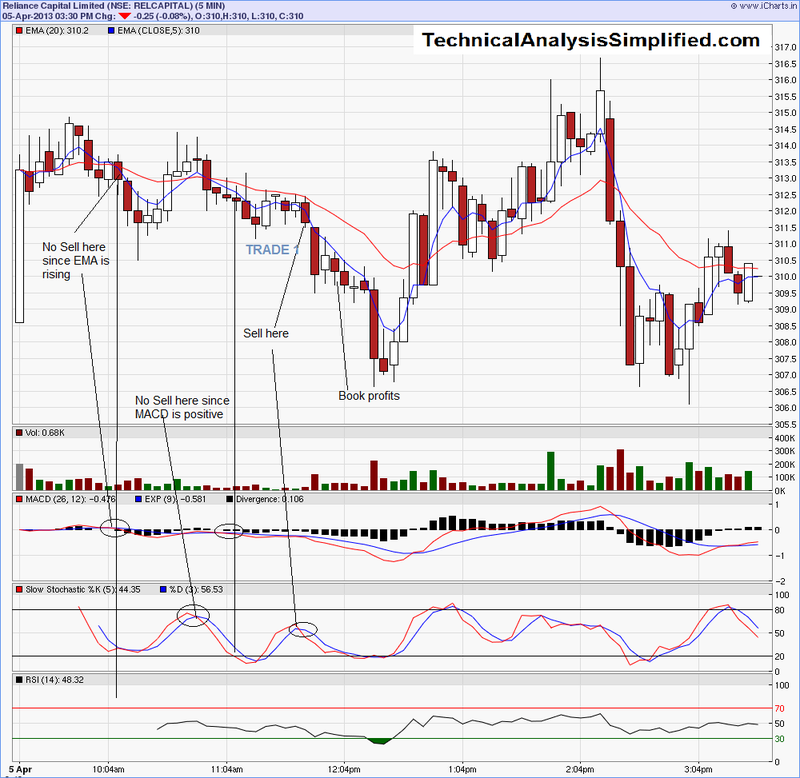 If Stochastics is not in sell mode, wait for the stochastics to give a sell signal and enter the trade. 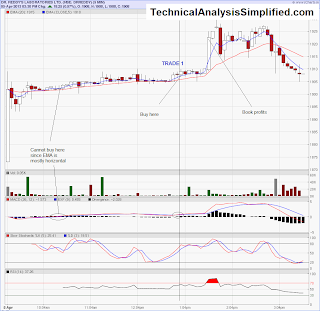 If Stochastics is oversold, a fresh sell signal can be used to enter if the MACD is still positive. Previous Swing high is the stop loss. Previous swing high is the high made in the just previous down move. Please see examples to understand stoploss points. As indicated before this is a scalping system. Book profits immediately on seeing profits and exit immediately when the stoploss is hit. 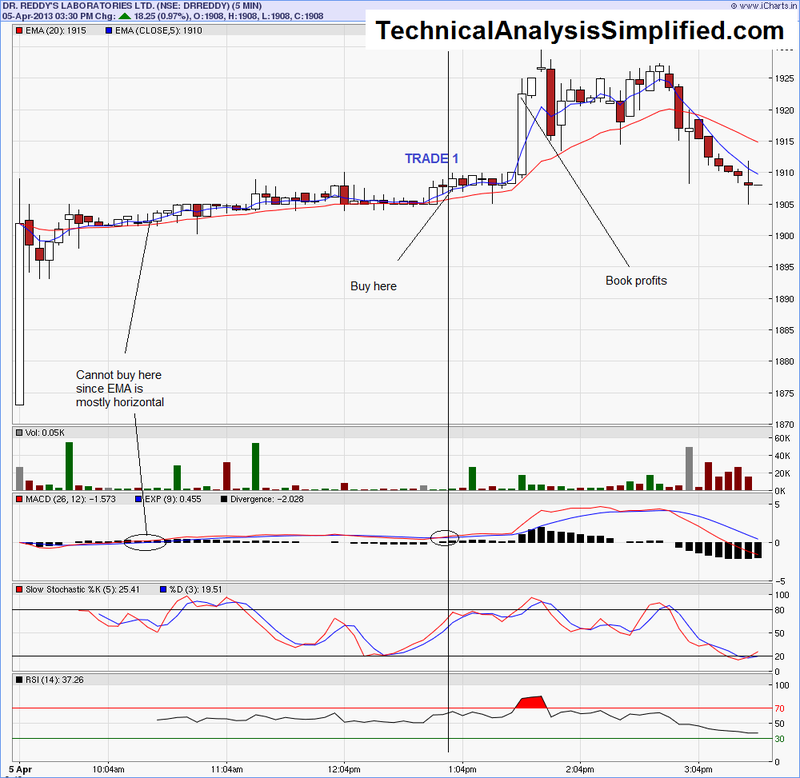 Stochastics is oversold; %K crosses above %D and moves above the oversold line and 5 min candle closes above 20EMA. A brief period of consolidation occurs just before the trade entry. Buy signal occurs above a key support/resistance level. Sell signal occurs below a key resistance / support level. 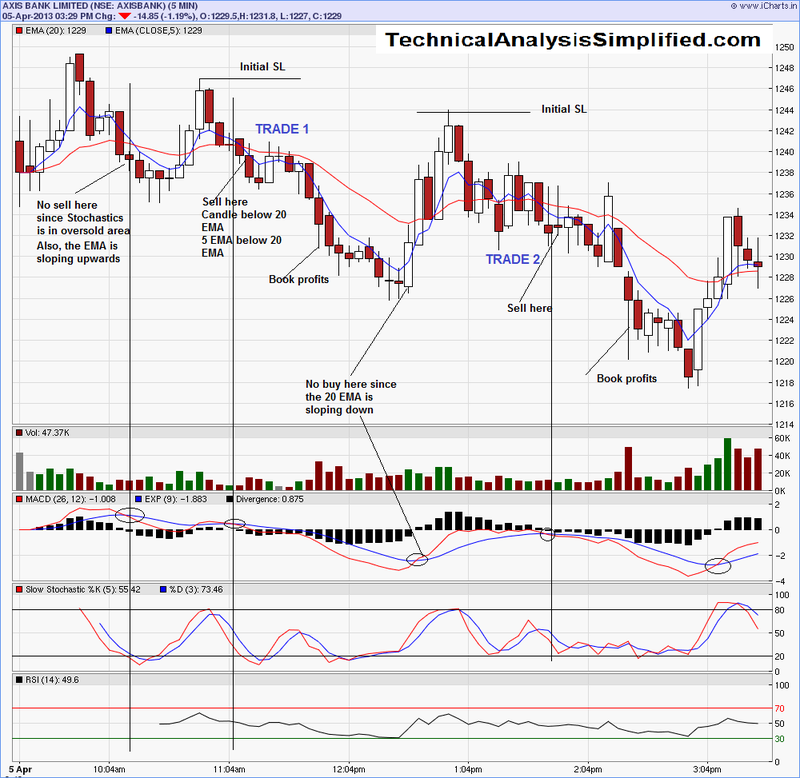 Trade is in the direction of higher time frame charts (15 min /30 min). Overall market is moving in the direction of the trade. Note: For the purpose of simplicity, RSI is not included as an indicator. There are other uses of RSI which will be covered in separate lessons. Nifty touched the resistance of 5600 and fell down continuously today on negative sentiment based on foreign fund selling. 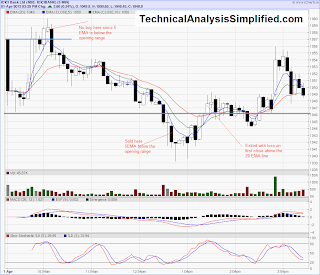 Support of 5530 and 5500was broken today.This has opened up the way for further downfall. On 10 April, 5535 is the resistance followed by 5575-5600 levels. Support levels are 5450 and 5420. Avoid intraday longs below 5480. Nifty will be positive above 5535 and bullish above 5575. SBI – Sell below 1978 for a target of 1969 with SL at 2000. TCS – Buy above 1515 for a target of 1525 with SL at 1499. Bajaj Auto – Buy above 1728 for a target of 1738 with SL at 1715. Tata Motors – Buy above 263 for a target of 265 with SL at 259. Above 266, fresh buy for a target of 269 with SL at 264. BHEL – Buy above 185 for a target of 186-187 with SL at 182. Call did not trigger. 185.10 was touched at open and the stock was continuously falling. Bajaj Auto – Buy above 1730 for a target of 1740 with SL at 1700.Call did not trigger. Days high was 1721. ICICI Bank – Sell below 985 for a target of 980 with SL at 992. No opportunity to sell. Stock touched 985 at the time of close. Infosys – Sell below 2825 for a target of 2815 with SL at 2845. Target achieved. Below 2825, the stock touched 2756. 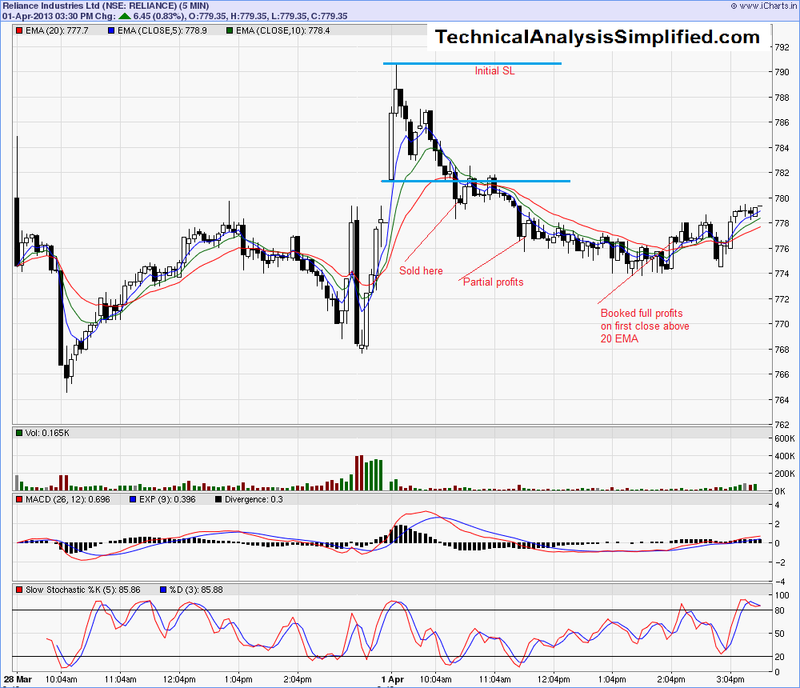 TCS – Sell below 1475 for a target of 1470-65 with SL at 1485. Call not triggered. Days low was 1477. L&T – Sell below 1320 for a target of 1314-1308 with SL at 1332. Target achieved. Days low 1313. 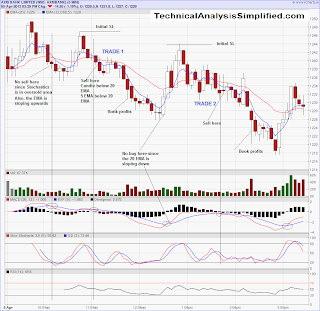 Tata Steel – Sell below 304.50 for a target of 303. Below 303, 300 is the target. No opportunity to sell. Stock was below 304.50 within 30 minutes of close. Posting three trades of today. 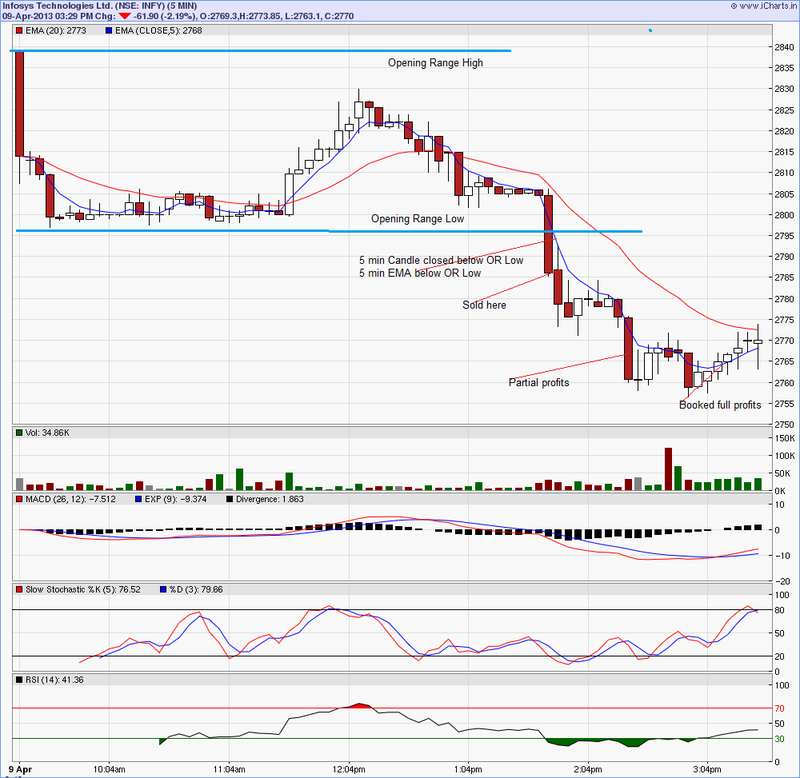 Two trades based on Opening Range Breakout Trading System. 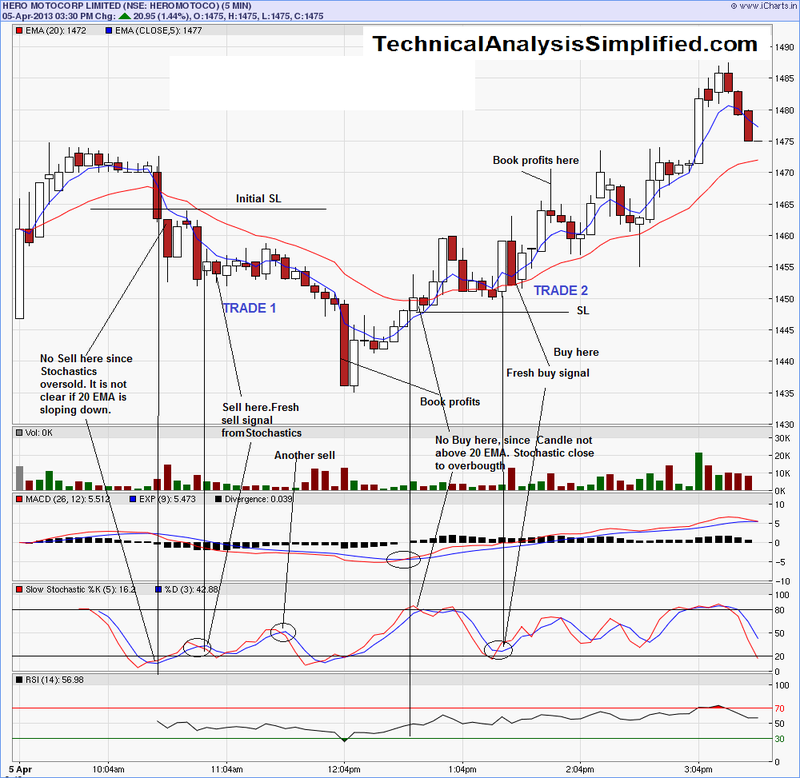 One trade based on Intraday Trading System - Technical Analysis Simplified. 1. Infosys - Opening Range Breakout Trade. 2. ONGC - Intraday Trading System based Trade. 3. BHEL - Opening Range Breakout Trade. Nifty was range bound and exactly between the 5535-5575 range today as in the pre-market calls. For 9th April, 5575-80 will again act as a key resistance 5535-30 will be the support. Above 5580, 5600 – 25 will be the resistance levels. Support will be at 5530 followed by 5500. Avoid intraday longs below 5530. Nifty will be positive above 5580 and bullish above 5600. BHEL – Buy above 185 for a target of 186-187 with SL at 182. Cipla – Buy above 397 for a target of 399-400 with SL at 394. Reliance – Buy above 797 for a target of 802-809 with SL at 787. Bajaj Auto – Buy above 1730 for a target of 1740 with SL at 1700. ICICI Bank – Sell below 985 for a target of 980 with SL at 992. Axis Bank – Sell below 1198 for a target of 1188 with SL at 1210. Infosys – Sell below 2825 for a target of 2815 with SL at 2845. 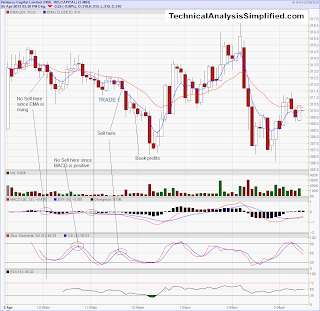 TCS – Sell below 1475 for a target of 1470-65 with SL at 1485. L&T – Sell below 1320 for a target of 1314-1308 with SL at 1332. Tata Steel – Sell below 304.50 for a target of 303. Below 303, 300 is the target. ONGC – Buy above 316 for a target of 317. Crossing and sustaining 317 will result in a target of319. Keep SL at 312. No chance of trade since the stock hit 318 before first 15 minutes. 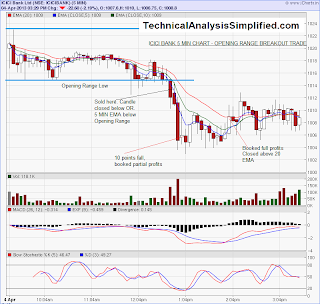 ICICI Bank – Sell below 996 for a target of 985 with SL at 1002. Target almost achieved. Days low 987. TCS – Sell below 1484 with SL at 1500 for a target of 1470.Below 1484, stock touched 1474. Axis Bank – Sell below 1214 for a target of 1200 with SL at 1232.Target achieved below 1214, the stock touched 1198. SBI – Sell below 2060 for a target of 2040. Sustaining below 2040 will give a target of 2020. Keep SL for shorts at 2075. Target achieved. Below 2060 stock touched 2028. Nifty ended the last week with a decline of close to 2%. 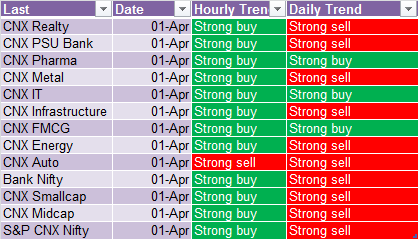 All sectors except Pharma have turned bearish in the daily charts. Ever since the 200 DMA was crossed, the market has turned extremely bearish and every rise will be faced with huge selling. Next week , we have Infosys announcing the results on April 12 Friday. On the same day IIP data will also be announced. Nifty crossed below the 200 DMA and is close to touching the first target 5500. Read the earlier post on Nifty outlook here. For 08 April, 5575-80 will act as a major resistance. Above 5575, 5600 and 5625 will be the resistance levels. Support will be at 5535 followed by 5510 and 5480 levels. Avoid intraday longs below 5535. Nifty will be positive above 5580 and bullish above 5600. ONGC – Buy above 316 for a target of 317. Crossing and sustaining 317 will result in a target of319. Keep SL at 312. 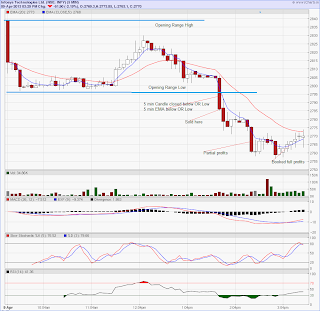 RELIANCE – Buy above 786 for a target of 792 with SL at 779. Bajaj Auto – Buy above 1725 for a target of 1735-50 with SL at 1709. Tata Steel – Buy above 309 for a target of 311 with SL at 307. ICICI Bank – Sell below 996 for a target of 985 with SL at 1002. 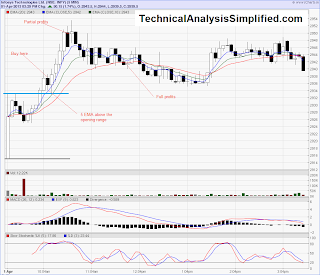 TCS – Sell below 1484 with SL at 1500 for a target of 1470. Axis Bank – Sell below 1214 for a target of 1200 with SL at 1232. SBI – Sell below 2060 for a target of 2040. Sustaining below 2040 will give a target of 2020. Keep SL for shorts at 2075. Today we have all calls in profits. ICICI Bank – During the previous swing low in March, ICICI bounced from 997 levels. This level is critical support for ICICI Bank. Sustaining below this will open up 990-980 levels intraday. SL for shorts is 1015. Target achieved. Below 997, ICICI touched 985. TCS – Sell below 1500 for a target of 1490-80 with SL at 1520.No opportunity to sell. Stock touched 1485 in first 15 minutes. Hero Motors – Sell below 1450 for a target of 1440 with SL at 1465. Target achieved. Below1450, the stock touched 1435 today. Reliance Industries – Sell below 764 for a target of 760-756 with SL at 771. Call not triggered. Nifty finally made a decisive close below 200 Day Moving Average. Domestic worries related to financial irregularities and political uncertainties, mix of negative news from Europe and US added to the fall. FIIs are also in the selling mode particularly in large caps. This is the reason, we have also been on sell mode in blue chips in the few past few days. Reality and IT sectors were the biggest losers in todays trade. Resistance levels will be 5600-5625 followed by 5675. TCS – Sell below 1500 for a target of 1490-80 with SL at 1520. L&T – Sell below 1353 for 1345 with SL at 1368. Below 1345 targets are 1335- 25. Tata Steel – Sell below 303 for a target of 301 with SL at 306. Below 300, Tata Steel will fall to 290 in few trading sessions. Hero Motors – Sell below 1450 for a target of 1440 with SL at 1465. Axis Bank – Sell below 1240 for a target of 1233. Below 1230, the stock could slip to 1220-1200 levels. BHEL – Sustaining below 177, could give quick 2 points profit up to 175. The stock is likely to bounce strongly from 174, so do not hold shorts for long. If sustained below 174, then there will be heavy fall any day. Reliance Industries – Sell below 764 for a target of 760-756 with SL at 771. I have given below two of todays trades. 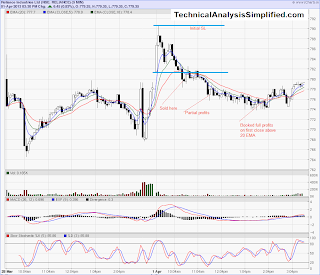 Both based on the levels and Opening Range Breakout. 1. ICICI Bank Intraday Sell - Opening Range Breakout. 2. Tata Steel Intraday Sell - Opening Range Breakout. We had 8 out of 9 calls achieving targets. 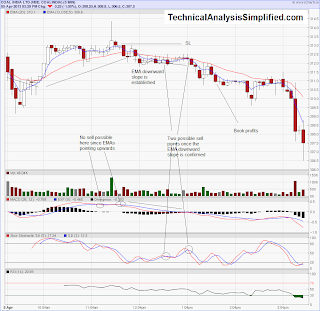 ICICI Bank – Sell below 1025 for a target of 1017 with SL at 1040. Target achieved. Days high was 1023 and days low 1002. SBI – Sell below 2090 for a target of 2078 with SL at 2110. Below 2075, the next target is 2050. Target achieved. Below 2090, the stock touched 2057. Days high was 2097. Axis Bank – Sell below 1270 for a target of 1260 with SL at 1285. Target achieved. Below1270, the stock touched 1240.Days high was 1270 exactly. Tata Steel – Sell below 315 for a target of 313-311 with SL at 318. Target achieved. High was at 315.5. Tata steel touched 303 during the day. Hero Motors – Sell on rise to 1510 levels with SL at 1522 for a target of 1490. Alternatively below 1485, the next target is 1475 followed by 1460. Call not triggered. Tata Motors – Sell on rise to 259-60 with SL at 262.50 for a target of 256. Below 256, next target is 253. Short term target for Tata Motors is 242 in next 5-6 trading days. Sold at 260, SL hit. Bajaj Auto – Sell below 1684 for a target of 1665 with SL at 1700. Target achieved. Below 1684, the stock touched 1656. L&T – Sell below 1390 levels with SL at 1406 for a target of 1375-60 levels. Target achieved. Days high was 1386. Low was 1353. Nifty crashed below critical support levels on 03April after disappointing PMI data combined with bearishness from global markets. The market over-reacted to the numbers. US markets are also down at the time of writing this. On 03rd April, Nifty touched exactly the support level of 5650 as covered by me in the pre-market call. This is a good support point. If the market moves below and sustains, then it opens up for 5600-5590 levels. 5600 is the level from which markets bounced back in the last down move. Going below this level is highly bearish and could open up 5300 levels as I had written many times before. For 4th April, Nifty resistance levels are 5700-20 followed by 5745-50..
Support levels are 5625 followed by 5600. Sustaining below 5600 will result in 5580- 5550. We are taking only sell positions. There is a possible up move after the big fall, but is unlikely to be sustained. ICICI Bank – Sell below 1025 for a target of 1017 with SL at 1040. SBI – Sell below 2090 for a target of 2078 with SL at 2110. Below 2075, the next target is 2050. Axis Bank – Sell below 1270 for a target of 1260 with SL at 1285. Tata Steel – Sell below 315 for a target of 313-311 with SL at 318. Hero Motors – Sell on rise to 1510 levels with SL at 1522 for a target of 1490. Alternatively below 1485, the next target is 1475 followed by 1460. Tata Motors – Sell on rise to 259-60 with SL at 262.50 for a target of 256. Below 256, next target is 253. Short term target for Tata Motors is 242 in next 5-6 trading days. Bajaj Auto – Sell below 1684 for a target of 1665 with SL at 1700. L&T – Sell below 1390 levels with SL at 1406 for a target of 1375-60 levels. 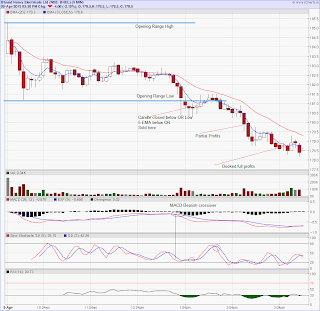 Reliance Industries – Sell below 770 for a target of 765-60 with SL at 778. Here is the video of a highly profitable sell based on Opening Range Breakout of Bajaj Auto. One of the biggest advantages of the ORB trading system as explained here is scalping and trend riding in two lots - booking first lot as quick profits and the riding the second lot as long as possible till the stock closes above 20 EMA helping traders to take full advantage of highly bearish days like today. Please see the video for more details on the trade. ONGC – Buy above 319 and book profits at 321 with SL at 316.Call did not get active. Cipla- Buy above 391 for a target of 395. Above 395 , 398- 400 is the target. SL for longs is 388. Target achieved. Days high was 398.5. Bajaj Auto – Sell below 1740 for 1733 – 25 with SL at 1760. Target achieved. Below 1740, the stock was close to 1752. Close to 90 points fall. 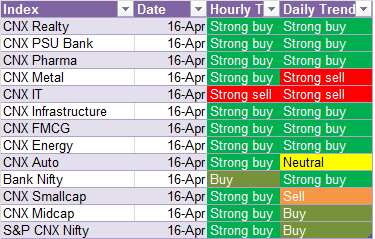 Indian markets made a good up move on 02nd April on renewed buying in pivotal stocks and support from European markets. US markets are rallying with a record new high when this is being written. Sentiment has turned positive for global markets for the time being. We have PMI data announcement on 03 March which can create some volatility if the data is not favorable. Today Nifty crossed the resistance of 5720-25 levels and touched the next level of 5750 which is a positive sign. Next resistance is 5780 followed by 5810. Closing above this level will lead the rally to 5880 levels in the coming days. Support is 5725-5700. Below 5700, markets will slip to 5680-5650. Avoid intraday longs below 5700. Markets will be positive above 5730 and bullish above 5760. ONGC – Buy above 319 and book profits at 321 with SL at 316. Reliance – Buy above 798 for target of 805-7 with SL at 788. Cipla- Buy above 391 for a target of 395. Above 395 , 398- 400 is the target. SL for longs is 388. ICICI Bank – Buy above 1055 for 1062-1070 with SL at 1045. SBI – Buy above 2150 for a target of2160-2170. Above 2170 , a rally towards 2200 is possible. SL is 2135. 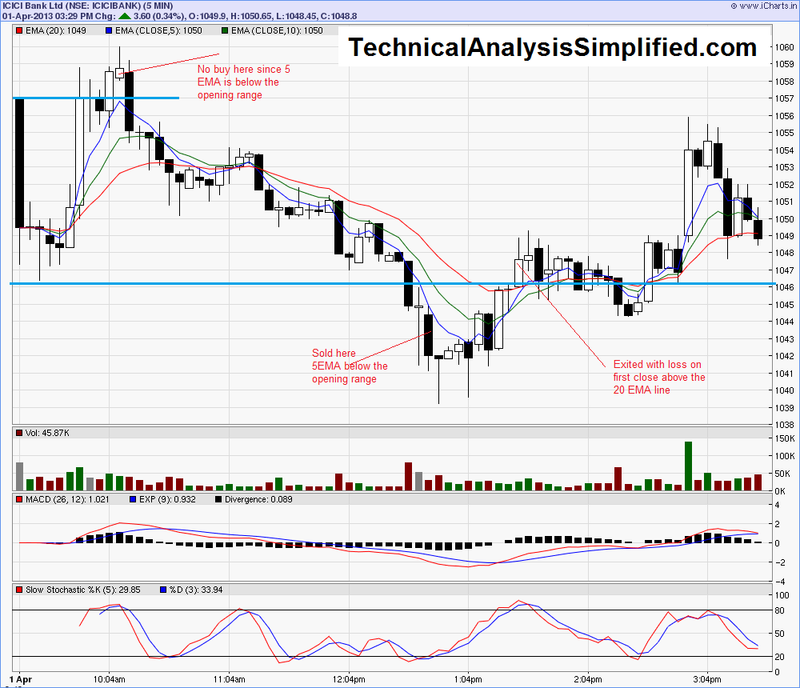 Todays trades were based on the Opening Range Breakout system. 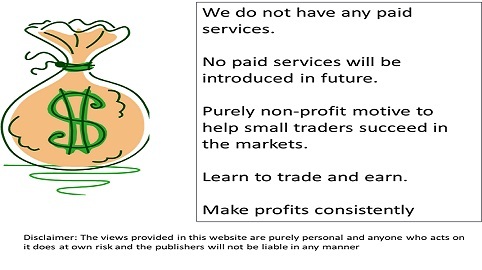 Please click on the below link to understand the system fully. Please post a comment in case of any queries.